80% of data and analytics leaders with global life insurance and property & casualty carriers surveyed by McKinsey reported that their analytics investments are not delivering high impact. What’s stopping them from delivering high impact? 38% of those surveyed cited a failure to integrate analytics into workflows and frontline systems. This was the leading obstacle to high impact analytics, outscoring even poor data quality or a lack of strategic support or alignment. Here at Decision Management Solutions, we’ve worked with many life insurance and property & casualty carriers around the world and seen this problem first hand. We see returns on analytic investment bog down while companies keep spending money on analytics and analytic infrastructure even though they often seem to struggle to operationalize those investments and start generating a return. We’ve developed a framework to address this that we call DecisionsFirst analytics. This framework will help you deliver high impact analytics. Analytic teams have historically been encouraged to “begin with the data.” They analyze the data available and try to see what analytic models it contains. Michelangelo had a similar attitude and once said “Every block of stone has a statue inside it and it is the task of the sculptor to discover it.” Contrast this with an architect, who begins by understanding what a client needs and then seeks to use the available space and materials to deliver the best possible value. To deliver high impact analytics, analytic teams need to start thinking more like architects and less like artists. Rather than begin with the data and try to “discover” what model is inside it, analytics teams should begin with a business problem – the decision they wish to improve – and use this to direct their work. A high impact analytic improves decision-making. Analytic teams can’t build a high impact analytic without understanding which decision they are trying to improve. They need to know how that decision is made today, how the business want to make that decision in the future and what makes a good decision. This is the fundamental basis of business understanding, a key first step in any analytic model development methodology. Decision modeling is the most effective elicitation technique for decision making we have found. Decision making is modeled by the business and analytics teams working collaboratively using an easy to understand graphical decision requirements model based on the industry standard DMN notation. Both teams understand what decision the analytics will improve, how that decision is made, and what deployment context will be required. The analytics team also knows which business process(es) will use the analytic (because the process requires that the decision be made at some point), which people must believe the analytic (because they make this decision day to day) and how the analytic will impact business results (because decision models identify which metrics or KPIs are affected by which decisions). Following this approach, everyone can clearly see what analytic will fit in the decision, how precise it needs to be, what data is needed, how it can be deployed, measured, explained, and more. One insurance client we are working with has used a decision model of their claims handling decision to identify how they will be able to use a predictive model that identifies fraud as well as a second that identifies medical wastage alongside existing policy and regulatory decision-making. Begin with operational decisions, not strategic ones. 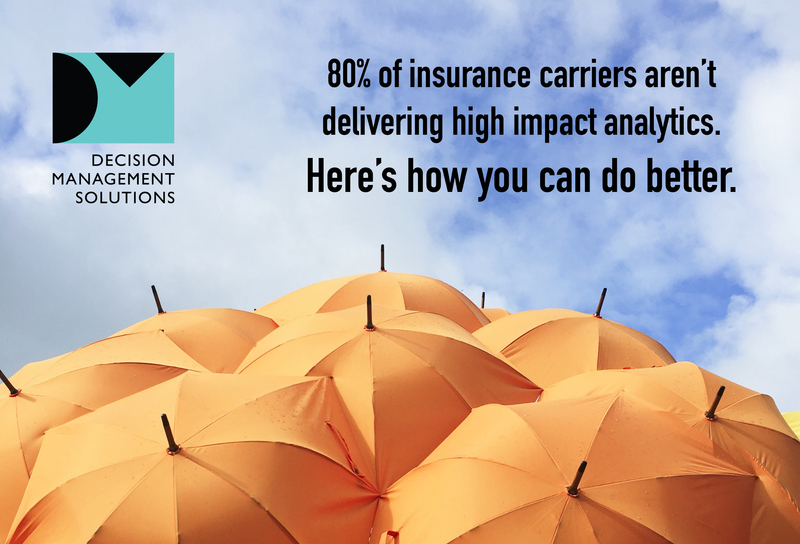 Insurance companies, like other companies, want their analytics investments to be strategic – to have a strategic impact. As a result, analytic effort and resources are often focused on executive and management decisions. There’s an assumption that analytics must impact the C-suite’s decisions or at least those of executives. This focus feels strategic but leaves the bulk of the value from analytics on the table. Our experience is that the highest impact analytics are those that focus on improving operational, day to day decisions. All the data for your analytics are created by day to day operations. Data about customers, risks, policies and claims is created one transaction at a time. To build high impact analytics from this data, the right place to focus is on operational decisions. An operational decision – is this product suitable for this customer, what rider should be cross-sold to this customer, what is the right price for this policy for this customer, how should this claim be handled – is high volume and transactional. Every improvement in that decision is multiplied by the thousands or tens of thousands of times it is made each week. These decisions are where risk is acquired and priced and where customer engagement happens. Even a small improvement in an operational decision has a high impact because that improvement is delivered thousands of times a day. High impact analytics are used in operational decisions. Even when analytics teams do focus on improving operational decisions, putting the resulting analytics into frontline workflows remains challenging. Too many analytics teams think their work is done when the analytic is finished, not when the business is benefiting from it. Some simply throw their completed models over the fence for IT to implement without a second thought. Others wrap their analytics in visualizations and graphical explanations that are standalone and disconnected from the company’s front line systems. To deliver high impact analytics, they need to collaborate with IT to embed their analytics into automated decision-making. Most IT departments lack a platform for automating decision-making. Even if they have technology for deploying analytics as real-time scoring engines, and many do not, wrapping traditional code around these scores lacks the agility and transparency necessary to collaborate with analytic teams as they develop and evolve analytic models. To get high impact from analytics, companies need an analytic deployment platform that is transparent, agile and business-friendly. A Business Rules Management System or BRMS is the platform companies need. Combined with decision modeling, a BRMS delivers decision services that correctly implement the business’ decision-making logic. This logic is derived analytically or judgmentally and combines analytic scores with other data to make decisions. The BRMS packages up an analytic decision into an agile, transparent, manageable decision service that is easy to integrate into frontline systems and workflows in a standard Service-Oriented Architecture. Another insurance client has done exactly this. An initial deployment of a BRMS for next best offer uses rules that are derived from the work of the analytics team. While they are implemented as business rules, they are analytical business rules rather than policies or best practices. A decision model puts all this in context and is used to manage the business rules. As the decision service moves into production, other analytics are being readied for deployment as real-time scores that will be consumed by the rules like any other data, with adaptive and learning models rapidly following. And as these new models are added, none of the calling systems will have to change because the BRMS has packaged the decision as a decision service that can be continuously improved without changing its signature. To do better than your peers and deliver high-impact analytics, make sure your analytic teams begin with a focus on decisions, not data; focus first on operational decisions, not strategic ones; and adopt an agile analytic deployment platform that integrates analytics and business rules. We are doing all these things with our clients and they work. Our clients have analytic teams that are more relevant, reduce the time it takes to put analytics to work, and ensure the analytics fit into their business operations. And they deliver strategic impact ―one operational decision at a time.